I'm so glad to finally be able to post some pictures of the greenhouse! We've been in the new house for almost a week and are having so much fun. The internet was just hooked up today, so it's back to life as we know it. Before we had even finished moving our things over to our new pad, we had the greenhouse beds prepped and planted. This task took me and Jeff about 1 1/2 days of digging, watering and breaking up soil clods. It seems like the previous gardener used lots of peat in the greenhouse beds which were bone dry after 2 years of not being touched. We learned that just trying to water bone dry peat is like watering concrete! It doesn't work. The soil is nice and damp now though! So far, only the spinach and radishes have germinated in the greenhouse and we are waiting on the onions, carrots and beets. 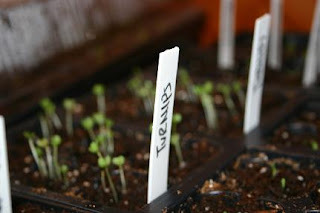 In the solarium I have 2 seed trays going with lots of lettuce, chard, cabbage, leeks, onions, herbs, violas, arugula, turnips, endive.... and others that I'm sure I'm forgetting. These are going strong and I'm thinking about hardening off and transplanting in the next couple weeks. We've got a min/max thermometer out in the greenhouse with a probe inside and outside. We've been getting down to 28-32 degrees at night outside, and the lowest greenhouse temperature was 48 degrees. 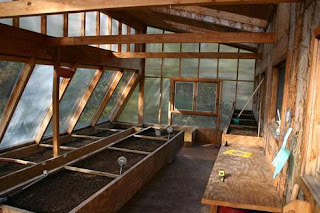 During the day it's been averaging between 60 and 75 outside but the greenhouse has gone up to 110-120! I'm thinking we need to get some better fans installed than the small solar ventilation fans in the greenhouse right now. I don't imagine many plants will do well with such drastic temperature extremes. 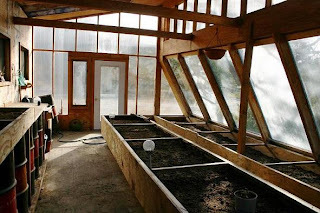 So that is the story of the greenhouse at this point. Jeff and I are both drooling over the thought of our own fresh veggies soon! I've been digging up recipes with arugula and radishes to be ready for our first crops.